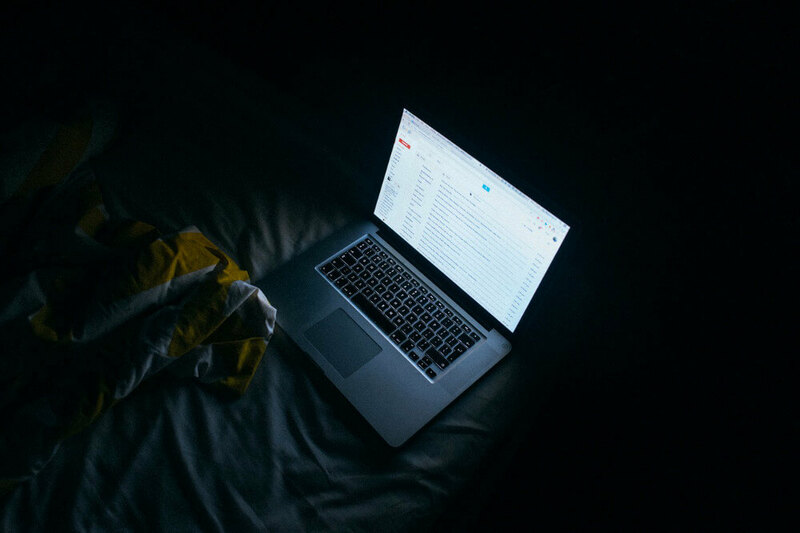 In today’s world, late-night exposure to bright lights is one of the most common issues affecting sleep quality, a fact which is often attributed to the widespread use of light-emitting screens. Basically, when you check your phone or laptop while lying bed, you’re making it more difficult for yourself to fall asleep, while also reducing your overall sleep quality. In the following article, you will learn more about why blue light is so detrimental to your sleep, and about what you can do to minimize its impact and improve your sleep quality. Our eyes can only see light within a certain range of wavelengths, which is referred to as the visible spectrum. The image below shows the wavelengths of light in this spectrum, as well as the wavelengths of ultra-violet light, which falls directly below the spectrum, and of infra-red light, which falls directly above it. Blue light around the 450-470 nm range has been found to negatively impact sleep quality, by acting as a signal for melatonin suppression. Since melatonin is a hormone which the body secretes in preparation for sleep, its suppression interferes with your internal biological clock by disrupting your circadian rhythm, which causes you to stay awake even if you would otherwise prefer to sleep. Note that, in general, light at a shorter wavelength leads to a greater suppression of melatonin production, which is why blue light, which has a relatively short wavelength, is so disruptive. Conversely, red light, which has the longest wavelength of visible light, is the least disruptive to your ability to sleep. Reducing the amount of blue light that screens emit is relatively simple, and doesn’t require much effort on your part. You can do it either by tweaking the settings on your devices (if there is a built-in function), or by using an app which allows you to filter out blue light. This is easy to do, and will significantly improve your sleep quality, by blocking out a lot of the blue light that you are exposed to late at night. In addition, an added bonus of filtering out blue light from your screens is that you might also benefit from having less eye strain if you tend to look at your screens in a relatively dark environment. Replace these lights where possible. Cover these lights with something that dims them, or only allows reddish light through (e.g. red cellophane). Avoid exposure to such lights as much as possible before bedtime. The last two points are applicable in general, even if the light source isn’t blue (e.g. incandescent light bulbs). Essentially, the closer you are in time to the point where you go to sleep, the less light you want to be exposed to. Accordingly, if you must be exposed to light before bedtime, try to dim it as much as possible, while also filtering out the blue light that it emits, by using a red-colored cover. Exposure to light before bedtime makes it more difficult for you to fall asleep, and reduces your sleep quality. In general, exposure to light with a relatively short wavelength (e.g. blue light) is more disruptive to your sleep than exposure to light with a relatively long wavelength (e.g. red light). Blue light is especially detrimental to your sleep quality, since it interferes with your body’s biological clock and circadian rhythm, by suppressing the secretion of melatonin, a hormone which is crucial for sleep regulation. The easiest way to avoid blue light before bedtime is to use apps or settings which filter it out from the screens of electronic devices that you use. You can also reduce your exposure to blue light from other sources, such as fluorescent light bulbs and LED lights, by replacing them, avoiding them before bedtime, or covering them with something that only allows dim, reddish light through.